The concept of pressure sewerage, by reducing solids by grinding, then pumping through small diameter pipes has been extensively used for some 40 plus years. It is recognized as a practical, feasible and economical alternative to gravity sewers where physical conditions are adverse to construction of a conventional system. 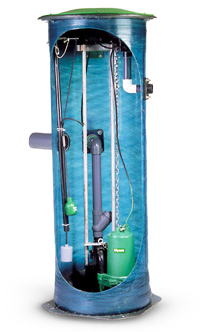 Pressure sewer systems effectively solve the problem of serving difficult lands. They work extremely well in rocky areas, hilly terrain, very flat land, sandy soils, waterfront property, soils with poor percolation, and buildings with seasonal occupancy. Pressure Sewage Systems provide an economical, reliable method of pumping sewage under low pressure through small diameter pipes in shallow trenches that closely follow the contour of the land just below the frost line. Please contact us if you have a building site with a challenging sewer connection. When Should I Use A Pressure Sewage System? If you are looking for a pump distributor, contact Simonds Machinery Co. in California, today for sewage pumps and pressure sewage systems. We specialize in the service, installation, manufacture, and refurbishment of pump stations. We know pumps inside and out!